Cups / LG cup / 3 koreans make it ...and 5 chinese! 3 koreans make it ...and 5 chinese! The chinese did it again. Now out of eight players left, five are chinese. The rest are koreans. 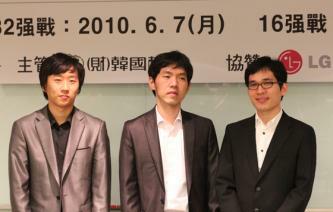 However, Gu Li, who previously beat the favorite of the tournament: Lee Sedol, lost his game to An Choyeong. Very close game though. Among other results Lee Changho defeated Tuo Jiaxi, Piao Wenyao won his game against Chen Yaoye, Kim Jiseok lost to Wang Yao and Kong Jie won against Mok Jinseok. The next round of games will be in november, in China. This site seems to have died down. What is the next best Go website to find the latest news (and sgf files maybe?) on the pro Go world? stefan.radu, did you read the article? It says that the next round of the LG Cup will only take place in November, so you will only see more updates on this tournament then. We post news under the category "Others" quite regularly so you may want to check them there. this is weird.... what happened with this web-site? no article posted since.. last month? 2 months ago? I'm quite surprise with the 12th move (w) ... could someone explain the interest of this move. And I thought the Koreans were the best at baduk! © gosensations.com All Rights Reserved. Use of this Web site is subject to our Terms and Conditions.